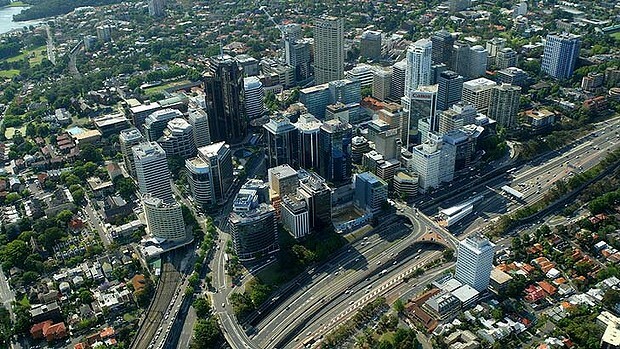 The Victorian government recently announced a raft of initiatives designed to expedite the growth of Clayton - and particularly the zones around Monash University and the related medical and research facilities from 80,000 today to a target of 180,000 over the coming thirty years. "Clayton used to be the site of the Volkswagen factory that then became the Nissan factory, which closed in the 1990s. Things have to change. We need to get better amenity for businesses and workers – offices, hotels and new road connections. We need basically great places to go and have a cup of coffee, a meal." That's a direct quote from Peter Seamer, Chief Executive of the Metropolitan Planning Authority, the body charged which with overseeing the process. And my eyes are rolling back in my head already. Because there's something so glaringly obvious missing here that I probably need barely spell it out, certainly to anyone who knows my obsessions. "We're planning for the most concentrated re-engineering of suburban jobs into an urban centre over a shorter timeframe than there is any precedent for in this city's entire history in a location that barely has a heavy rail service, has no light rail whatsoever, and whose many bus routes operate on third world service frequencies." And the bloke in charge of steering the whole thing isn't even able to cite public transport as a particular need. We simply need "new road connections". Whose houses are you going to bulldoze to achieve that magic, Peter? Or do we just put new road lanes over existing footpaths? 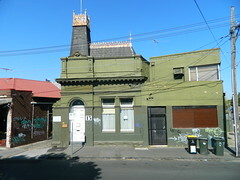 The thesis behind today's post actually derived from a brief exchange I had with Peter over at Urban Melbourne. Wherein I put to him that Sydney has stupendously outpaced Melbourne in achieving a proper decentralisation of jobs and transport patterns into suburban activity centres, and in fact all Melbourne has done over the period of Sydney's success is announce glib headline phrases and statements of intent - "the twenty minute city", etc., all entirely unsupported by any real enabling policy. In Sydney, 80% of the city's jobs are located outside its traditional CBD. In Melbourne, this figure is 81.4%, essentially the same. In raw terms CBD employment numbers are also almost identical, it's basically 1.2 versus 1.1 million jobs respectively, according to the ABS. However, for these suburban, ie non-CBD-based, jobs Sydney public transport has an 11.8% mode share against Melbourne's 6.3%. So in Sydney, fully 78,969 MORE people take public transport to suburban workplaces daily than do so in Melbourne. And this is the measurable quantum of the benefit. Through facilitating CADs to a similar degree of success to Sydney, Melbourne could pull 80,000 commuters out of their cars daily. Now, it's very difficult to ever be sure you're comparing apples with apples doing this sort of thing, in fact I've been unable to come across ANY studies that use the same methodology to assess the actual emplyment numbers in suburban centres in both cities, nor are there any detailed national studies. Alan Davies has done the best effort in THIS exercise, which uses the agglomerated ABS regional employment data. But unfortunately while Alan gives us lots of brilliant graphical representations, he doesn't give us the raw numbers. We'll return to Alan shortly. For the following tables, I've used the data from THIS excellent study into Sydney's employment patterns, and the majority of the figures for Melbourne come from Plan Melbourne, supported by a few other studies I've managed to dig up. Some quick commentary. It seems blindingly obvious that we have NO PLAN whatsoever to further accelerate the concentration of jobs in Campbellfield, Moorabbin, Knoxfield or Werribee. There's a tiny, cruel part of me that wants to suggest this is probably because Peter Seamer or someone like him doesn't think you can get a decent enough coffee there. But the first TWO of those are already Melbourne's third and fourth largest employment centers, and we're supposed to be drawing on existing successes. It's of course easier to achieve policy goals that are already half obtained than brand new ones. These are STAGGERING omissions. Using Alan Davies' data, this is how he sees Melbourne's suburban employment profile. On my map, it all looks something like this. Red indicates the highest employment areas, yellow the middle rung, and white the lowest. The arrows indicate centers that are NOT specifically addressed by Plan Melbourne. Overlaying the current heavy rail network (plus metro) on this map is particularly illustrative. The massively employing airport region is entirely unserviced. The network looks almost as if it were almost perversely designed to JUST miss the Monash, Moorabbin and Braeside employment centers. Most of the Heidelberg employment cluster is a LONG way from the rail. Anyone still alive and responsible for the effective termination of the Glen Waverley line right there deserves to be mown down by submachine gun. The workers of Knoxfield can pull the trigger. The equivalent picture up north looks very different. 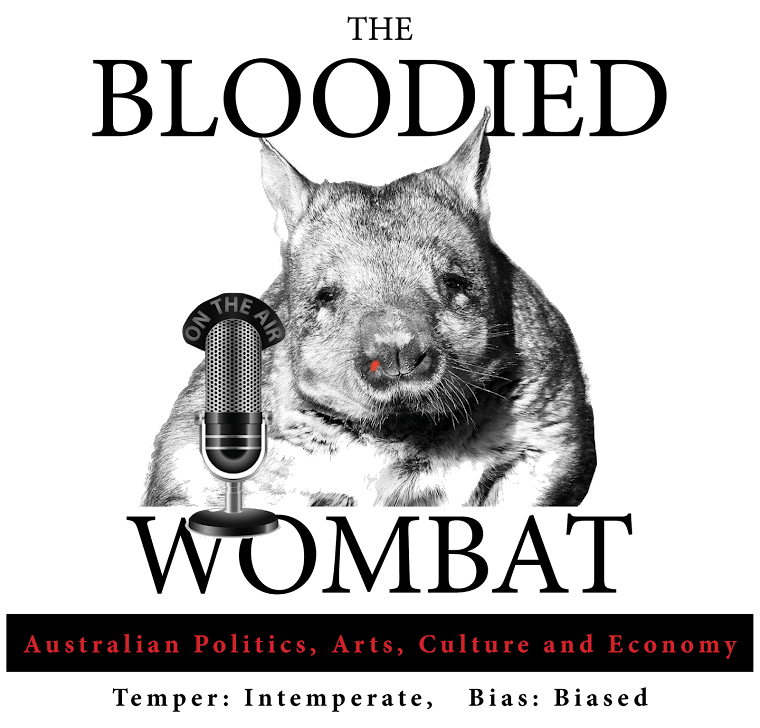 I am going to argue that, and dedicated Wombat followers will detect a soap box here, that it is specifically the less-radialised nature of the Sydney transport network which we will find to be a key factor in ensuring that every day in Sydney fully 80,000 fewer people shunt their personal petrol-powered tonne of metal across town to enable their workplace commute. And Sydney also shows us that suburban light rail can be part of the solution. A few quick comments on these. Firstly, I think that on an apples-apples basis, these numbers are probably underdone. 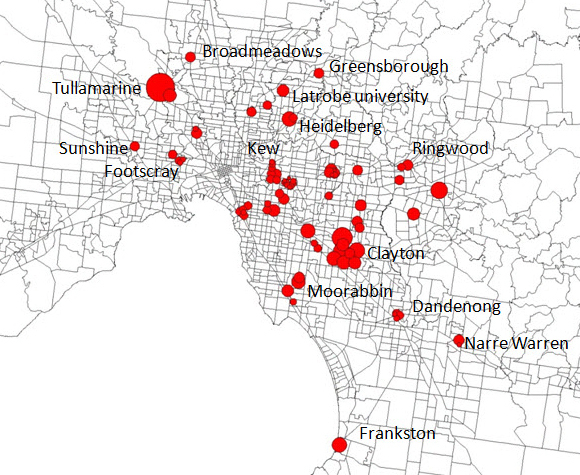 Do half as many people really work in Paramatta than in Monash? Intuitively I'd say not. And where Sydney's roll-call has five centers over thirty thousand, Melbourne has only two, albeit with five more just under that threshold. A detailed look at transport patterns into these centers individually is illustrative. Of Melbourne's top seven, only Dandenong can lay claim to having anything resembling a CBD. In Sydney, ALL the centers listed above other than the airport CAN rightly make that claim, and Sydney's airport is directly serviced by heavy rail. 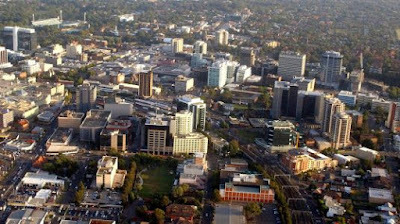 And let's just compare those to Melbourne's largest suburban skyline in Dandenong (Image courtesy Facey Real Estate). The comparison actually almost seems cruel. So while both cities house a similar number of suburban jobs, the location of those workplaces in Melbourne's suburbs would seem to be significantly more dispersed, and in Sydney significantly more concentrated within specific activity centers. Parramatta is unquestionably the poster child for the provision of non-radial rail access to a suburban center anywhere in Australia. You can make an efficient and sensible trip to Paramatta without needing to go anywhere near Sydney CBD from all the way out at Emu Plains or Richmond, Carlingford, Epping, Leppington, Campbelltown, Macarthur or even Hornsby at a stretch. For those whose Sydney geography is as challenged as mine, that's basically ALL of South-west Sydney, and MOST of the entirety of Western Sydney. When you factor in the rail corridor to the CBD, the effective residential catchment enabled by heavy rail is geographically MASSIVE. 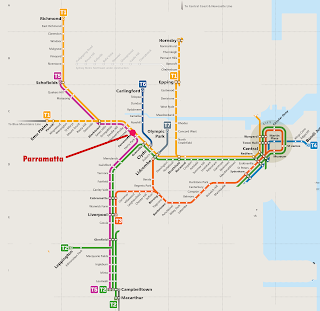 And that's before we've tallied up the FIFTY bus routes that converge on Parramatta CBD, the TWO planned light rail routes, the train service to the Blue Mountains or the Ferry service from Circular Quay. This PwC study for the Committee for Sydney suggests one other factor that may be at work here. Parramatta is almost smack bang in the middle of Sydney's residential "center of gravity" and very close to the employment and economic centers also. And the trends for all these are broadly TOWARDS Parramatta. 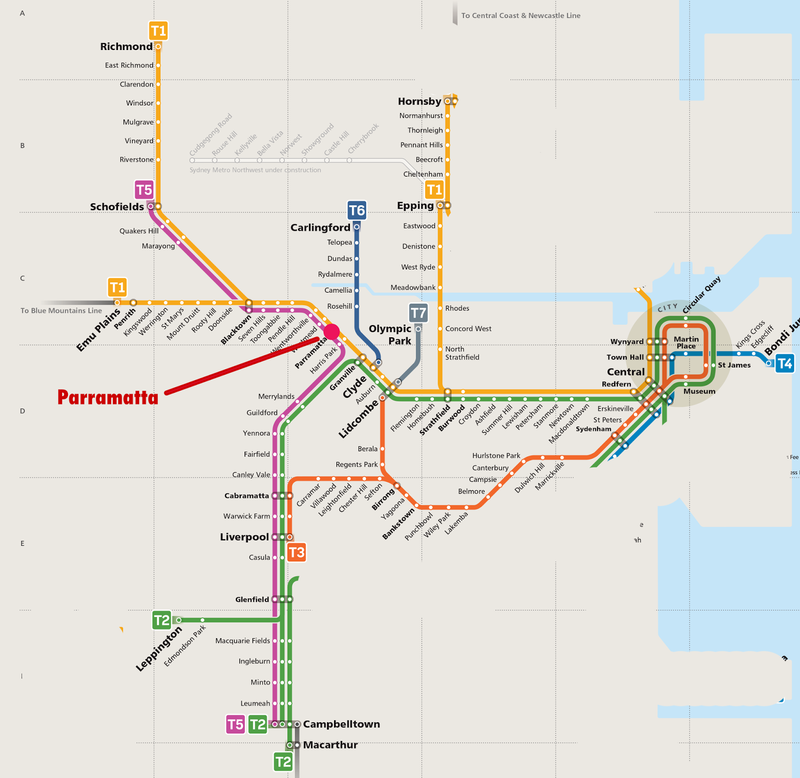 The PwC study also introduces another suggested success factor here - the direct connectivity of these economic centers, and so once again the less-radial, more networked nature of Sydney heavy rail seems to be a key enabler. It is possible to travel by heavy rail between almost all the identified Sydney activity centers without the need to travel inwards, and wastefully towards the CBD. For the Melbourne list, the best you could do would be get to from Dandenong to Clayton station without traveling through the CBD. 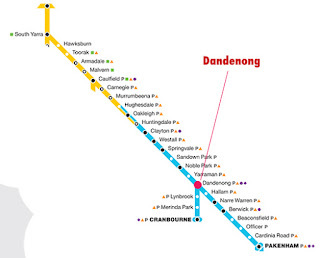 Dandenong of course looks very different, and it's also blisteringly obvious that it's the RADIAL nature of Melbourne's heavy rail network that's the governing factor here. 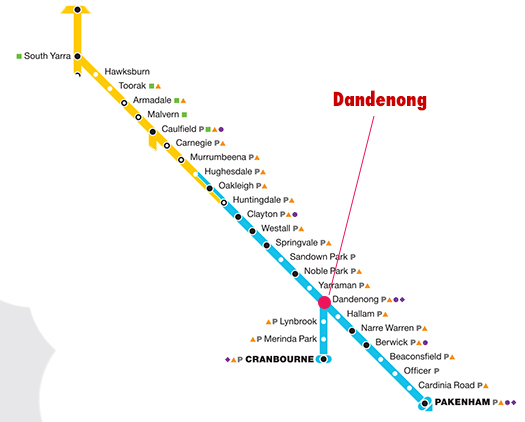 I could have added the Frankston line in here, but the Caulfield interchange is a LONG WAY - twelve stations from Dandenong. In contrast, the Strathfield interchange which gets you to Hornsby and Epping is only NINE stations from Parramatta. So, it becomes pretty easy, at least based on this evidence to make the argument that "Paramatta's success as a suburban activity center is a direct function of the number of public transport linkages to the center - and most particularly of heavy rail linkages. And from there, it becomes pretty obvious to this commentator. Melbourne won't replicate Sydney's success with CADs until it DE-RADIALISES ITS HEAVY RAIL NETWORK. End of story. In Melbourne, the centers of gravity look VERY different. All three are trending strongly INWARDS towards the CBD, where in Sydney they trend away from the CBD and towards Parramatta. This is basically a result of the fact there's only ocean east of Sydney's CBD, where Melbourne's been free to radiate every direction except basically due South from its CBD. 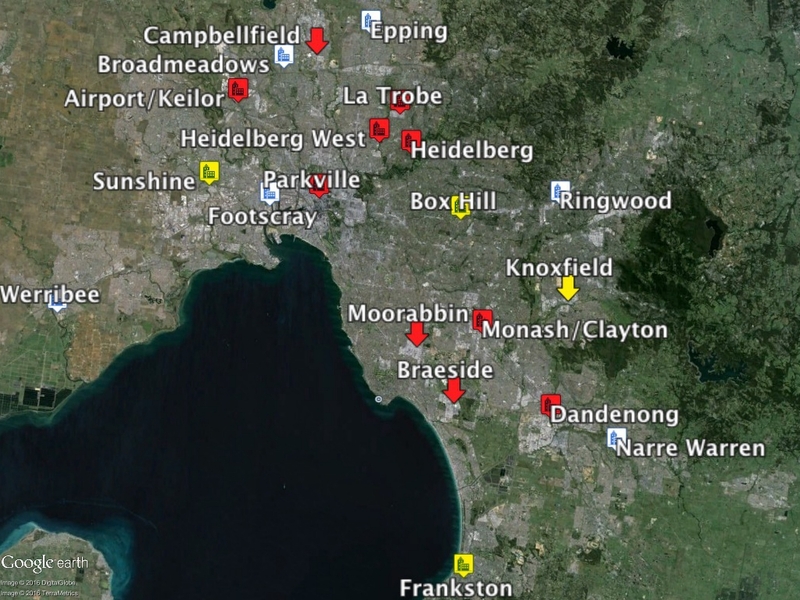 And Melbourne knows the East is full, and the North and West are going to carry the motherlode of future development. So Melbourne is going to be FAR better positioned than Sydney to have its CBD take a higher proportion of its total employment mix, without reducing the potential employment catchment for those jobs. 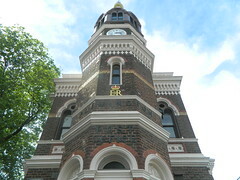 The CBD should return to being Melbourne's economic center of gravity within the next twenty years. By which time Sydney's equivalent will be 30 kms to the west of its CBD. So the second takeaway here should be that factors such as the employment, residential and business investment patterns within the macro urban area also map on to the micro. Of course it's easier to create a second CBD in a location where broader consolidation factors are already at work. We seem to be getting this wrong. In Melbourne we seem to have failed at the most basic level to make adequate long-run or even short-run plans for suburban employment clusters. In this city, we can't even agree what the designated activity centers ought to be, nor do we appear to be referencing existing successes in future planning. Anthony Albanese thinks Box Hill is the rolled gold best target for a Melbourne CAD. Absolutely nothing in the above analysis supports this. Why does Plan Melbourne ignore Campbellfield, Moorabbin and Knoxfield, and prioritise areas that have SIGNIFICANTLY lower levels of current employment? It seems obvious to this observer that it ignores these areas because of lack of heavy rail access. So this is all arse-up. Rather than starting with "Heavy rail is the key factor here, and we will need to allocate major future infrastructure spending in order to deliver optimal results", we seem to be stuck in "Heavy rail is the key factor here, but we don't have the stomach to put in the necessary investment to reconfigure the network, so instead of a SUCCESS FACTOR, we will treat heavy rail as a LIMITING factor and ignore all the people that are going to continue working for the forseeable future in Moorabbin and Knoxfield." But has Sydney actually done much in policy terms to facilitate things, or have they instead benefited from a number of natural factors in their favour? A complete history is a little beyond the scope of this meager blog. Suffice to say Melbourne has enacted very little actually in the way of concrete policy supporting CADs. Sydney now has a statutory authority charged specifically with their faclitation. 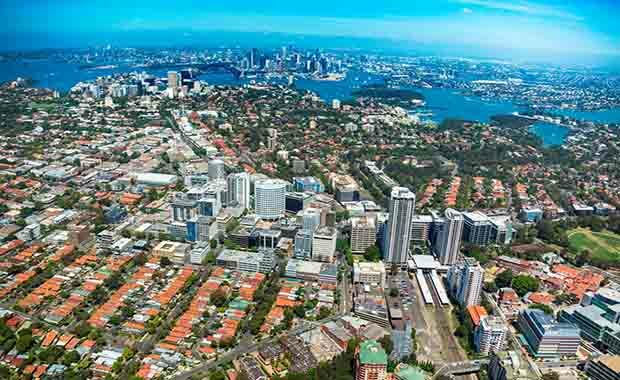 The NSW state government is actively promoting Parramatta as a "second CBD", and has provided a range of policy initiatives supporting this, including two major new light rail routes and the proposed relocation of the Powerhouse Museum. In contrast, Melbourne's MPA is very tellingly NOT focussed on consolidation activities. Its responsibilities are broad enough that a large part of its focus is planning for greenfields suburban fringe residential, and the number of consolidation initiatives showcased on their website indicates what tiny fraction of their resources is actually dedicated to this. And from the outset, their CEO has proven incapable of identifying the lack of heavy rail into a location where you want to add 100,000 jobs is even an issue. 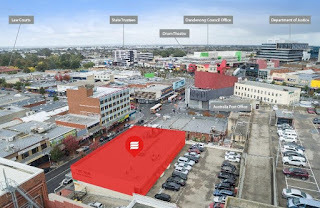 The planning minister to have blanket power over all land around 500m from all railway stations in Metropolitan Melbourne. 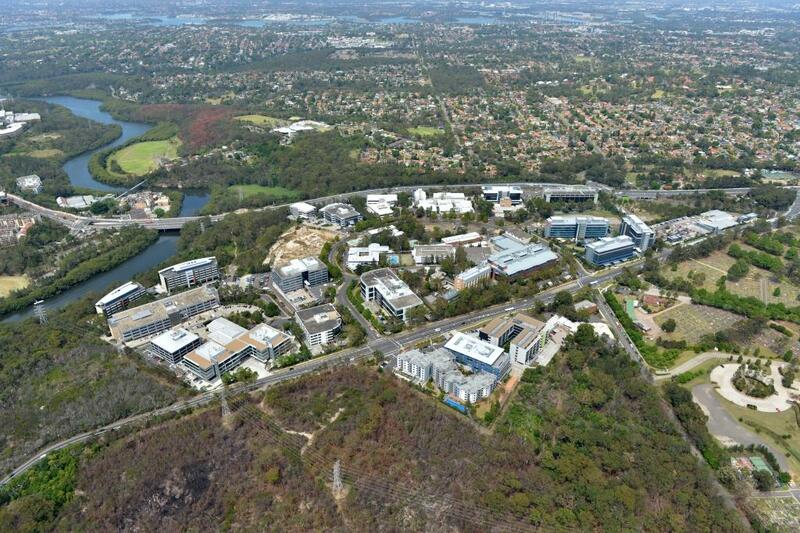 A parallel objective is the consolidation of activity from surrounding peripheral areas towards a more CBD-like core. And FINALLY ... and you all saw this coming ... we need to de-radialise our heavy rail network and invest in new networks that act on radial tragectories not from the CBD, but rather from the activity centers themselves.